Pay a ONE OFF, $10 bond at any participating cafe and receive your drink in a reusable CupCycling™ cup and enjoy the ongoing use of the reusable cups forever. One simple payment - once only - too easy! Return your used CupCycling™ cup to ANY participating cafe and get your next coffee in a clean CupCycling™ cup. We take care of the cleaning, so you never have to wash a cup - or remember a cup... even better! Reuse - Continue to enjoy the use of CupCycling™ cups at all participating cafes in our network throughout New Zealand and in most cafes, you'll enjoy a discount on every coffee you purchase. And around and around they go - That's CupCycling™! What is the CupCycling™ Programme - Who Started It? Conceived by Steph & Nick Fry, the proud Kiwis behind IdealCup™, The CupCycling™ Programme is the very first 'reusable cup swap system' to be rolled out in New Zealand; using our New Zealand-made, lifetime reusable IdealCups! Started in July 2017 in Motueka, CupCycling™ has proven itself to be a simple and effective REUSE SYSTEM, which really does do what it says - reduces thousands and thousands of single-use cups from landfill! Already in 9 regions throughout NZ and in Canada too, we've diverted thousands and thousands of nasty single use cups from landfill using our SIMPLE, EFFECTIVE and COMMUNITY FOCUSED CupCycling™ Programme. CupCycling™ is NOT a model designed for our business' commercial gain. We developed CupCycling™ as a SOCIAL ENTERPRISE; to sit alongside our IdealCup business - its focus is PEOPLE OVER PROFIT! CupCycling™ is about engaging with PEOPLE and have a real discussion about Culture Change; getting ALL OF US working together to make a COMMITMENT to move away from the the single use culture we have created. We are driven by a desire to make a cultural shift in kiwis mindsets, providing a reuse model which really does CHANGE HABITS; rather than just paying lip service to change. Our CupCycling™ model isn't about promoting our IdealCup brand, nor is it about promoting individual cafe brands – it's about EVERYONE SUPPORTING a regional identity and working together, as a community, to make a significant dent in single use waste to landfill. 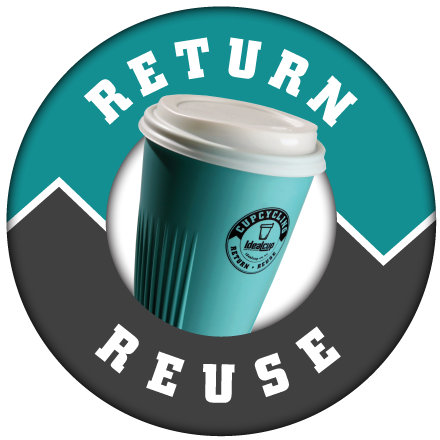 With CupCycling™, multiple participating cafes in a community/region band together to reduce disposable cup waste to landfill, by promoting the CupCycling™ "reusable cup swap" system throughout their region. With CupCycling™, the customer pays JUST ONCE... a one off $10 'membership' (includes their first coffee) to join the CupCycling™ programme and enjoy the ongoing use of a reusable CupCycling™ cup from any participating cafe in the region or around New Zealand. Customers simply return their dirty cup to any participating CupCycling™ cafe and get a clean cup with their drink and only pay for the drink therein-after. No need to pay each time... $10 bucks once and you've joined the family..... and around and around the cups go.... (a small deposit, 'borrow' option is available if someone should forget their cup). We're already seeing the CupCycling™ cups moving around New Zealand from region to region as people travel - it's a powerful way for a region to showcase their community identity and have a common brand for all to enjoy. 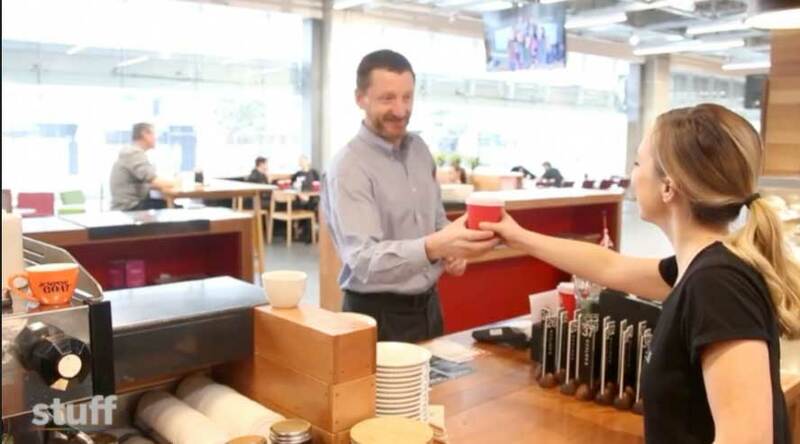 The CupCycling™ model is flexible and can be used by just a single cafe wanting to have a "reusable cup swap system" for their own customers. We encourage larger numbers of cafes within a community/region to work together, to ensure the greatest impact. And we collect data, which supports the success of our CupCycling™ programme. Get in touch to find out how YOUR TOWN or CORPORATE OFFICE can get involved and start diverting all that nasty single-use waste from landfill! We're so very proud so many regions around New Zealand have reached out to us, to make CupCycling™ a reality in their communities. We constantly receive such positive feedback from our wonderful regions, telling us how they completely "get" what we're setting out to achieve, that the model is so community focused and has such a positive 'feel good' vibe. We also get extremely positive support and buy-in from regional councils and stakeholders, thrilled to support a New Zealand made product and initiative, that they are proud to put their name on. Our CupCycling™ cafes understand the intentions of our CupCycling™ Programme and have chosen our model to represent their sustainable goals and beliefs, whilst they continue to strengthen their values as a community within our beautiful Aotearoa. And even Prince George in British Columbia, Canada! The CupCycling™ Programme is a ONE OFF COST to participating cafes. There are NO ONGOING MONTHLY FEES. You simply sign up, pay once and proceed to not only save the planet, but MAKE your business money and SAVE your business money - it's a WIN, WIN, WIN! One key attribute of our CupCycling™ programme is that we here at IdealCup, work hard behind the scenes, to engage with Local Councils, Boards and Community Groups, to garner their buy-in, with a view to securing some money towards the upfront cost of the programme, for all the cafes in your region. To date we have successfully secured sponsorship funding for most of the regions we have rolled out with CupCycling™. It's not a given we will get some funding however, we've got a fairly persuasive argument that Councils want to see waste reduction to landfill and CupCycling™ is a simple, cost effective way they can support that. Is your REGION on our list? Would you like to see CupCycling™ in your town? Do you want to Join the Original Reuse Revolution and help us to make our beautiful New Zealand clean and green once more? Get in touch to find out how YOUR TOWN can get involved and start diverting all that nasty single-use waste from landfill! *The bond is non-refundable to the customer and each cafe retains the money received from the bond. This can then be used to purchase additional CupCyclingTM cups, if they are required for your cafe. single-use cups from landfill in Motueka in just over 1 year! Ask your local cafē to get involved!